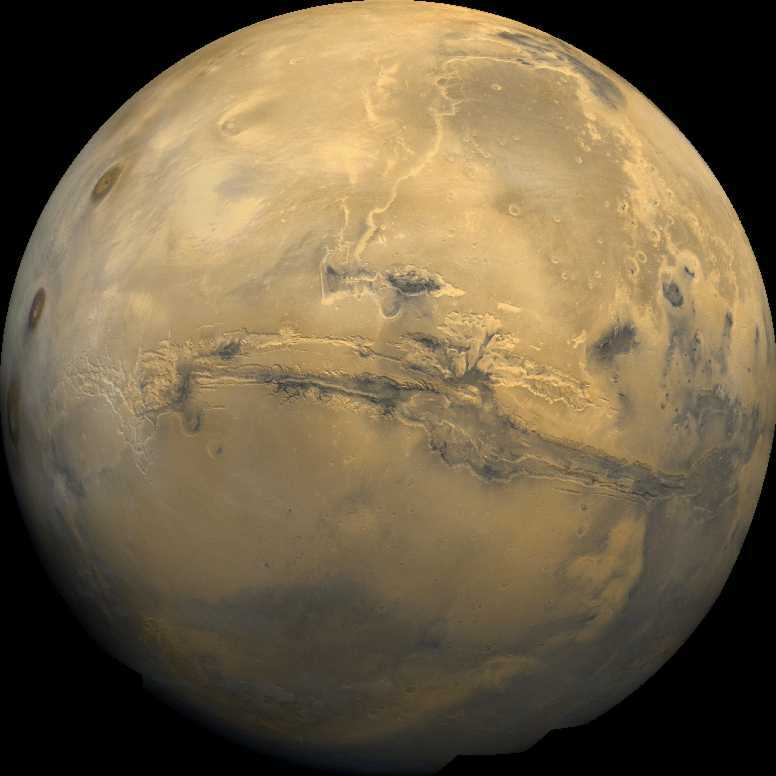 This image is a mosaic of the Valles Marineris [VAL-less mar-uh-NAIR-iss] hemisphere of Mars. It is a view similar to that which one would see from a spacecraft. The center of the scene shows the entire Valles Marineris canyon system, more than 3,000 kilometers (1,860 miles) long and up to 8 kilometers (5 miles) deep, extending from Noctis Labyrinthus, the arcuate system of graben to the west, to the chaotic terrain to the east. Many huge ancient river channels begin from the chaotic terrain and north-central canyons and run north. Many of the channels flowed into a basin called Acidalia Planitia, which is the dark area in the extreme north of this picture. The three Tharsis volcanoes (dark red spots), each about 25 kilometers (16 miles) high, are visible to the west. Very ancient terrain covered by many impact craters lies to the south of Valles Marineris.